A venetian-party-based tactical RPG has raised almost half of its required £45,000 Kickstarter goal within the first 48 hours of funding. Need some tactics in your life? Here are the best RPGs on PC. 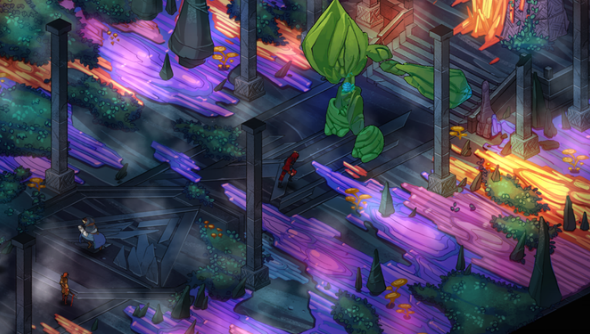 Masquerada: Songs and Shadows, an isometric pause-and-plan real-time RPG, is already looking in an advanced state of development, but Singaporean developers Witching Hour Studios require a little extra to polish the game and get it into players’ hands. We’ve written previously about the game’s influences, looking like a mix of Baldur’s Gate and Bastion and playing like Supergiant’s other hit game Transistor. Each character who joins your party is imbued with the power of a mask reminiscent of the grand Balls held in Venetian aristocracy. Your job as private investigator Cicero, banished from a civil-war-ridden city, is to return and discover the root of the troubles around you. Everything plays out through fully voice-acted scenes and dialogue, with VO talents including Jennifer Hale and Matthew Mercer, of Fire Emblem: Awakening fame. The game can be played in a hack-and-slash Diablo-style manner, or can be paused to allow for more advanced control of the characters in your party, allowing their abilities to be combined together. To see if Masquerada: Songs and Shadows is your sort of bag, take a look at the Kickstarter page and watch the well-produced video full of pretty, Renaissance-worthy art. You can net a copy for the lowest tier (£14/$20) in the next 11 days.